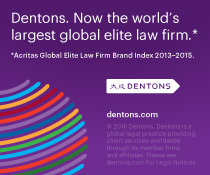 We are delighted to announce our new global law firm, Dentons! On March 28, FMC combined with international firms Salans and SNR Denton. Each founding firm has built its solid reputation and valued clientele by responding to the local, regional and national needs of a broad spectrum of clients of all sizes—individuals; entrepreneurs; small businesses and start-ups; local, regional and national governments and government agencies; and mid-sized and larger private and public corporations, including international and global entities. We are now working together with 2,500 talented lawyers and professionals in 79 locations in 52 countries across Africa, Asia Pacific, Canada, Central Asia, Europe, the Middle East, Russia and the CIS, the UK and the US. Our Securities Litigation team now has a global network that will benefit Dentons’ clients. Check out Introducing Dentons for an overview of our new firm and please do not hesitate to contact us with any questions or comments. These are very exciting times — for our clients, for our work and for the insights we bring to this blog. To find out more about our new firm, about what makes Dentons different, please visit www.dentons.com.